UNDATED - For the week ending Sunday, cool, wet weather limited fieldwork across parts of South Dakota, according to the USDA's National Agricultural Statistics Service. Daytime high temperatures were 15 to 20 degrees below normal for many locations during the latter half of the reporting period. Rainfall totals varied widely across the State. Some heavier rainfall amounts were located in already saturated areas of the southeast causing ponding and flooding in planted and to-be planted fields. There were 3.0 days suitable for fieldwork. Topsoil moisture supplies rated 5 percent very short, 24 short, 66 adequate, and 5 surplus. Subsoil moisture supplies rated 6 percent very short, 27 short, 64 adequate, and 3 surplus. Winter wheat condition rated 2 percent very poor, 9 poor, 35 fair, 53 good, and 1 excellent. Winter wheat jointed was 56 percent, well behind 79 last year. Headed was 10 percent, behind 20 last year and 16 average. Spring wheat condition rated 0 percent very poor, 5 poor, 51 fair, 41 good, and 3 excellent. Spring wheat emerged was 95 percent, near 91 last year, and ahead of 76 average. Jointing was 8 percent, behind 16 last year. Oats condition rated 0 percent very poor, 3 poor, 31 fair, 61 good, and 5 excellent. Oats emerged was 95 percent, near 94 last year, and ahead of 81 average. Jointed was 20 percent, equal to last year. Barley condition rated 0 percent very poor, 3 poor, 47 fair, 50 good, and 0 excellent. Barley emerged was 94 percent, well ahead of 72 last year and 65 average. 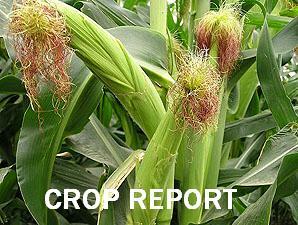 Corn planted was 88 percent, ahead of 81 last year, and near 84 average. Emerged was 47 percent, ahead of 38 last year, and near 43 average. Soybeans planted was 56 percent, near 52 last year, and ahead of 50 average. Emerged was 11 percent, equal to last year, and near 13 average. Sorghum planted was 19 percent, behind 32 last year, but equal to average. Emerged was 1 percent. Sunflower planted was 12 percent, equal to last year, and ahead of 6 average. Alfalfa hay condition rated 6 percent very poor, 25 poor, 44 fair, 23 good, and 2 excellent. Pasture and range condition rated 4 percent very poor, 15 poor, 37 fair, 40 good, and 4 excellent. Stock water supplies rated 2 percent very short, 15 short, 80 adequate, and 3 surplus.